Only one workday was planned for May - and it coincided with a vintage car club touring the museum. Here is what went on. Al Sumrall and Ian Whitaker have a plan going forward to spruce up "Old Pete" and at least begin doing ground runs with the engine. They have acquired a new fuel sight gauge to replace the old one but have not installed it yet. There is also a prop swap in progress with the Piper Cub - one machine's prop was too much, the other machine's prop too little. The Cub flies great after the swap and it is hoped that the Cub's prop will work well on Old Pete! 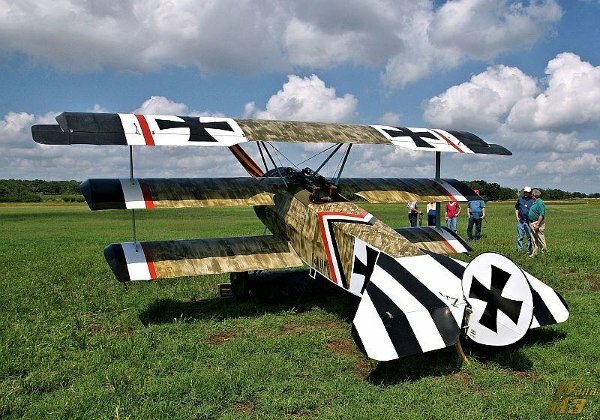 The engine on the Triplane was started and run for the first time since the airplane was reassembled in April. Prior to the engine run Mike Craig and his father, Don Craig, had to fabricate a new gasket to stop a leak in the gascolator. The visiting tour group gathered around the Triplane for the engine run - and while they were impressed, the volunteers were not. The initial engine ground run was a troubled affair! The engine would run momentarily on the prime, but obviously wasn't getting sufficient fuel to continue running. In addition, the engine was not responding appropriately to the controls - surging and sputtering without the controls being touched. Mike had brought a plastic bag full of the plastic liner he'd removed from the fuel/oil tank when he stripped and rebuilt the tank to resolve the leaks. So, Mike and Don concluded the remainder of the system could use a good flush and flow check. 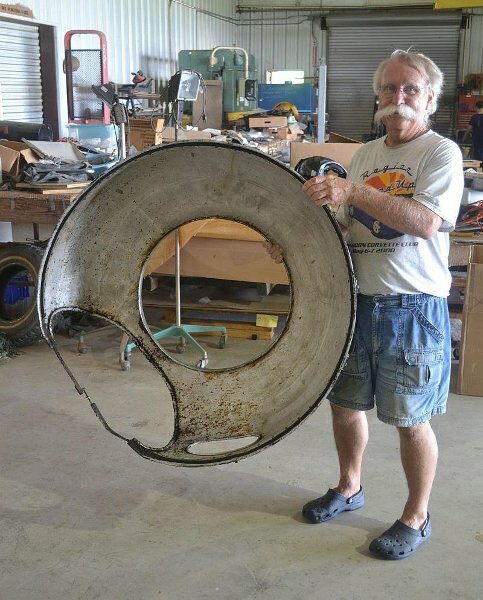 Mike felt that the fuel system wasn't routed as efficiently as it could be so they disassembled every part, clearing out debris and blowing compressed air through it to ensure that the entire system was clear of trash - and they found lots of debris scattered throughout every component in the system. At each step in the process they verified that fuel flow through the system was open and clear! The system was re-routed as the components were tested and reinstalled. Late in the afternoon the engine was ready for another ground run where the motor ran very well and responded to controls as desired. A few details remain to be wrapped up: replacing the rubber fuel lines and securing the fasteners with safety wire. Mike also plans on starting a maintenance log for the airplane. Mike also removed the tail skid plate to modify it before the next workday. Currently the skid has a fair amount of spring pressure on it which appears to be preventing the blade of the skid plate from digging into the ground. Mike plans to remove the blade and weld on another longer & deeper blade to ensure good contact with the earth. Once again, the two Thomas-Morse projects were worked on under the guidance of project lead Tom Miller. Their first task was to remove the T-1 parts from T-2's airframe - the parts were kluged together to present a better visual for the Camp Mabry and Air Fair appearances and T-2 needed to be stripped so the restoration process could resume. The T-1 metal panels were still filthy from the years the aircraft was flying, so Jerry Stark and Sam Miller set about cleaning the metal cowlings up! As part of the process John Busch and Sam went to town to get more Easy-Off oven cleaner! Vintage Manufacturing is rearranging their work spaces and the long bench along the one wall had to go, so Tom and a few other folks excavated the tail feathers from under the bench. These parts had been covered several years ago and taken up through the first aluminum coats, but after the time spent under the table in the laser shop they too needed a serious cleaning! After the surfaces had been cleaned they were stored with the Thomas-Morse wings. Steve Richardson went about the task of cleaning up T-1's castor oil pump. The pump was filthy on the outside but clean on the inside with no varnish build up on the internal parts so it was cleaned up, bagged and tagged until time to install the unit on the airframe. The T-1 fuselage rub strips took another step towards being installed on the airframe - they were laid out on the workbench and stained so they'd match the rest of the airframe's wood. The plan is to varnish the strips in June and install them. The "Tommy Boys" spent some time searching through the stacks for aluminum sheet to begin fabricating fuselage panels for T-2. While they found some materials Steve decided it would be better to start with clean sheets of aluminum, so the material will be ordered. Also the search was on for piano hinge materials which allegedly are at Kingsbury, though none was found during the workday! The search will continue! After some thought Steve has decided that he will oversee the build-up of a rotary engine for T-2. And he believes he has a better core engine at his home hangar in Memphis. The core pulled from the LLC hangar is sitting in the machine shop - guess it'll go back into storage in June. No word about which engine is going into T-1. The Cub is essentially finished aside from side windows on the airplane. Steve and Ian took the airplane up in the afternoon, flying to another airfield to refuel the airplane. With the tour group coming at mid-morning Team Vehicles leapt into action as soon as the morning meeting broke up to get Ts moved from the hangar so the Triplane could be moved out and more space created in the hangars for the museum visitors to move through. The team then set about getting as many vehicles started and running so they could be paraded for the tour group plus they are critical to getting the volunteers to downtown Kingsbury for lunch! The only Model T to be really worked on was the Blue Racer. It was discovered that one of the wheel bearings was dry, so repairs commenced to get that put right. Al Sumrall and Lynn Howell returned to work on the Blue Racer May 28th after Al received new wheel bearing parts. The wheel bearings went on without trouble, but when they went to fire it up for a test drive it was noted the head gasket had blown on cylinder #4. Al now has one of those on order along with replacement crankcase oil spigots to replace the oil level spigots now fitted - Al does not favor these aftermarket items! Al also reports locating a metal TT cab in Austin, and he and Lynn will check it out as a possible acquisition to complete our own TT. The cab appears complete but has been sitting outside for several years as the owner built up a wood cab for his own TT. Al and Lynn hope to inspect the cab on Monday, May 28th. The Triumph is done for the time being - Kevin spent a little time riding it around the field for the visitors. Kevin Monahan has the Indian at his shop at home working to repair to the clutch and kick start lever and gear set. Kevin feels he has made some progress on the clutch issue, but found some damaged transmission parts that he brought for "show & tell". The search for replacements is on. Tom Moore and Doug Ratchford spent part of the day surveying each engine and working on a plan and cleaning supplies list for sprucing up each motor. Tom found a missing information placard he'd made for the Lawrence engine that he had inadvertently left behind at Air Fair. The Fredericksburg Vintage Car Club had made arrangements to visit the museum during the workday and arrived in their vintage cars about 10:30 AM. There were about 18 - 20 vehicles with as many couples to tour the museum. The engine run on the Fokker Triplane was quite a draw, as were the Model T vehicles being exercised and Kevin riding the Triumph around the grounds. Steve Freeman's PT-22 attracted quite a few of the visitors, as did the Canuck and the Fokker D.VII. A few of the members made donations to the museum before departing for lunch. 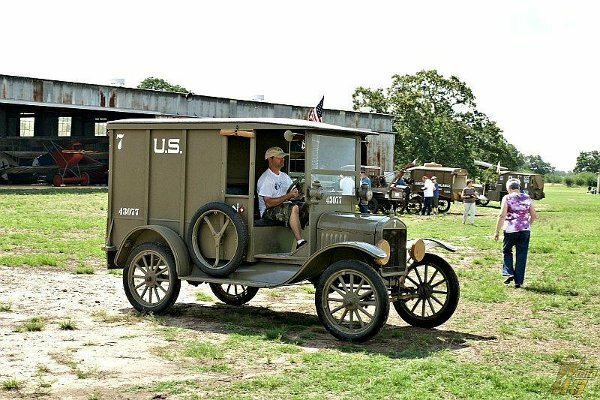 The Museum is planning on taking two Model Ts and the two motorcycles to the USAA company birthday party on Tuesday, June 12th. Kevin finished rounding up straps to tie down the Ts and trailer resources were verified. Al plans on taking one of the ambulances plus the Blue Racer. Could be subject to change though... the Blue Racer has a bearing problem on one of the axles and the Indian sounds like it is not exactly in one piece. Dave Edgerly and Dave Orloff missed the workday because they were in Mesquite, Texas attending a model contest as a vendor. Dave Orloff also entered a few of his models in the contest - four airplane models plus a figure and came away with two second place awards plus a first place award for his 1/32nd scale Wingnut Wings Junkers J.I model. So "Congratulations!" to Dave on his award winning models! The Daves report doing fairly well at the vendor side of it also, selling about half of the kits from the Zakrzewski donation that they'd taken with them to the event. Edgerly estimates (from the boxes in his garage) that he and Orloff have moved along about half the donated kits since they took possession of them late last year. Dave really wants his garage back! !